Titled Collaborative Research to Solve 21st Century Challenges, the event was designed to bring together faculty, students and the community to learn how social sciences faculty research is working to help solve today’s modern dilemmas--focusing on themes of social justice and environmental responsibility. “We need to really be embracing the future,” said campus provost and executive vice chancellor Alison Galloway in her opening remarks. “We have the chance to take control of our future by how we train our students to face a new world,” she added. Faculty mini-lectures included talks on such topics as political emotion, cultural differences in attention, using psychology to achieve criminal justice reform, technology and educational outcome, and understanding immigration and families through ethnographic research. 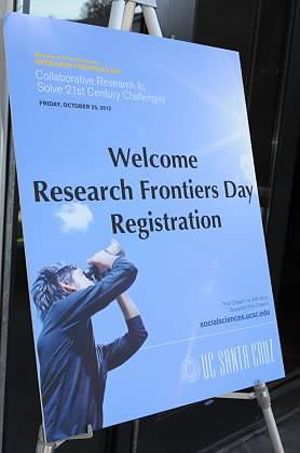 Research Frontiers Day also featured an introductory talk by Stacy Philpott-- associate professor of environmental studies and the Ruth and Alfred Heller Chair in Agroecology—on the integration of social and natural sciences at UCSC. Alessandro Duranti, professor of anthropology and dean of social sciences at UCLA, was the keynote speaker at the event. He spoke on the challenges facing higher education in the 21st century. Later, citing research on jazz musicians, Duranti noted that improvisation is a key to doing new things within a traditional environment or organization. But he said that for both jazz musicians and the university, improvisation is only successful with a solid underlying structure, and the support of your colleagues. “When you try something different, you can’t stay safe; you have to stretch. But it’s pretty hard to improvise if the people around you aren’t supporting you. And you have to be creative in a way that the audience can understand—for example by following a storyline or theme,” he added. Duranti’s address was followed by a poster presentation by Social Sciences graduate students on their research.